Submitted photo Marshall High School teacher Wayne Ivers holds his Minnesota Music Educator of the Year award. MARSHALL — A popular veteran teacher has received statewide recognition. 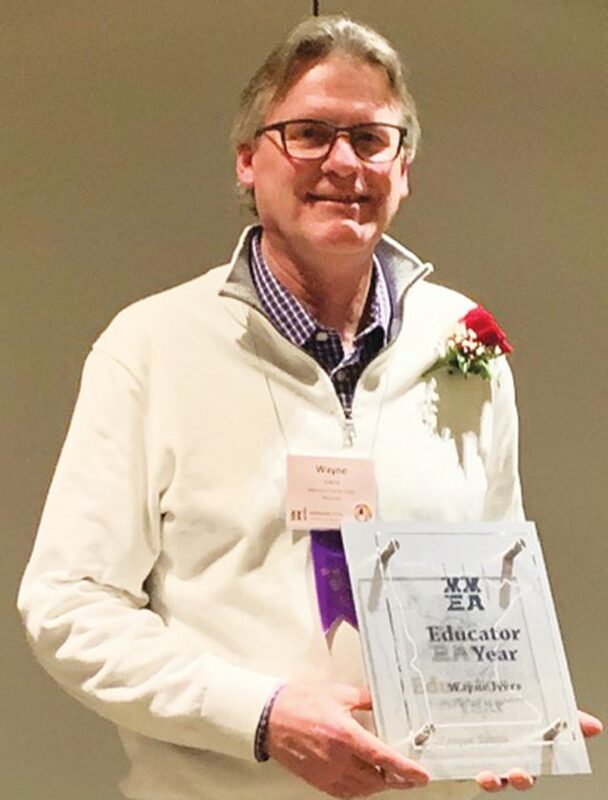 Wayne Ivers, the band director at Marshall High School, has been named the Music Educator of the Year by the Minnesota Music Educators Association. After realizing that it was a legitimate letter, Ivers said he was “very surprised, overwhelmed and humbled” to receive the award. Ivers has been employed at Marshall High School since 1983. Upon his arrival in Marshall the band program comprised 175 band members in two concert bands, one jazz band, one pep band, and a marching band that totaled 110 members. Currently the band program comprises 225 members involved in four concert bands, two jazz bands, two pep bands, and a marching band that totals 180 members. He is well-liked among his students. Brock Schultz, an MHS sophomore, is in the drum line with Holmgren. Under Ivers’ direction the band has become one of the top groups in the upper Midwest placing in the top of its class throughout Minnesota, South Dakota, Wisconsin, and Iowa. The marching band has competed 10 times in Bands of America Competitions placing in the top five in Class, eight of those 10 times and top 3 in Class four times. In 2005 the band placed 2nd in Class AA and 12th in Open Class Finals. In 2012 they were the St. Louis Super Regional Class A Champion. Ivers is one of the founders of the Pursuit of Excellence Marching Band Competition hosted in conjunction with the Marshall Music Boosters, Marshall Public Schools, and Southwest Minnesota State University. Pursuit of Excellence annually includes 18 of the best marching bands from Iowa, Minnesota, Nebraska, Wisconsin, and South Dakota. Ivers said music is vital to a good education.